The artworks shown here explore a range of reactions to the Holocaust – from the deeply personal responses of survivors to the more documentary approach of official war artists recording the sights of Bergen-Belsen after its liberation in April 1945. Some of the artists created their works within the camps and ghettos, while others used art to express the experience after liberation. A number of the survivors who made their homes in Britain after the Second World War turned to art as an outlet for their trauma. Many of them found their experiences difficult to talk about and, in the decades immediately after the war, they were not always encouraged to discuss them. Their works capture the ongoing legacy of loss, desperation and exclusion. Morris Kestelman (1905-1998) grew up in a Jewish immigrant family in the East End of London. In 1922, he won a scholarship to the Central School of Art and eventually went on to study at the Royal College of Art. In addition to producing abstract paintings, Kestelman worked in theatre and costume design. 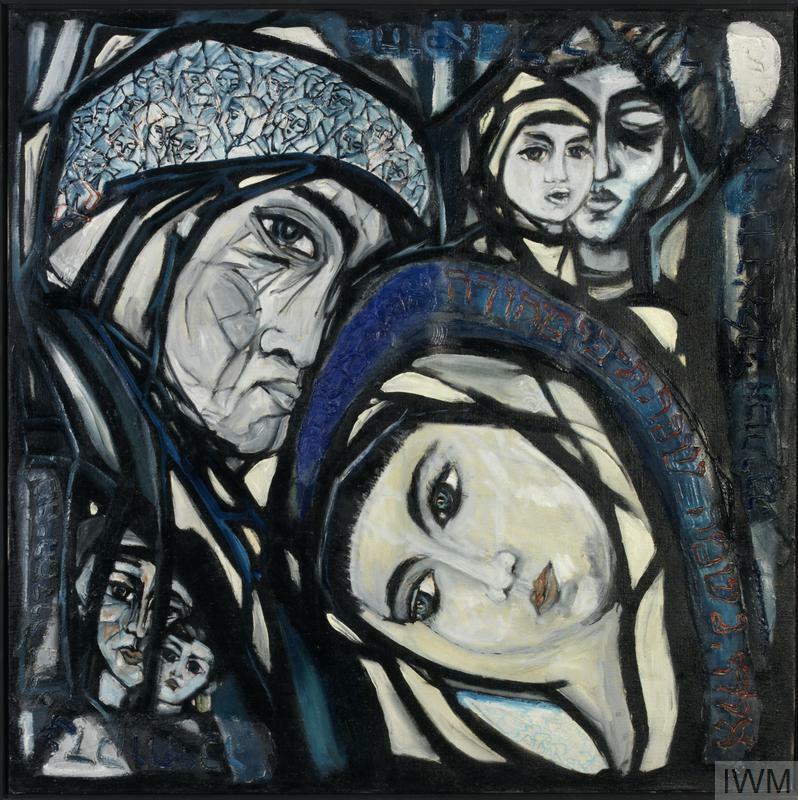 When news of the murder of Jews started to reach Britain in the early 1940s, Kestelman was one of the first artists to respond, taking his title Lama Sabachthani from the opening of Psalm 22: ‘My God, my God, why have you forsaken me?’. 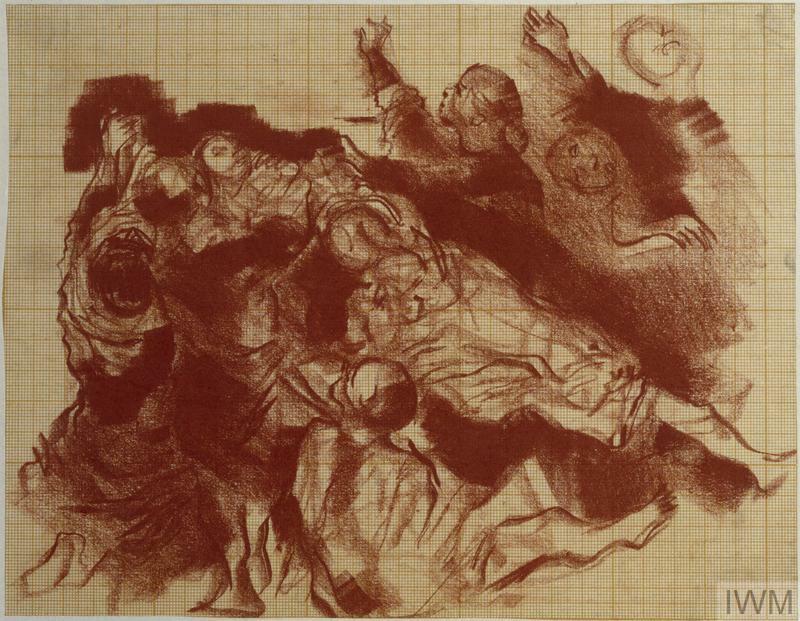 Emotional turmoil hangs heavy in the painting, which shows a group of Jews seemingly in despair at being forgotten or forsaken by God. They stand amongst burning buildings and piles of unburied bodies, surrounded by destruction and loss. Women are placed directly in the foreground of this painting and dominate the picture. Some raise their arms up in distress, beseeching God to help them, while others look as though they have given up in despair. This work is a rare and almost immediate British artistic response to news of the atrocities known to be taking place against the Jews in occupied Poland. A challenging question for those who study the Holocaust is 'who knew what and when?' during the war. Is the question in the painting's title also directed at those nations outside of occupied Europe? George Mayer-Marton (1897-1960) was born in Gyor, Hungary and served in the Austro-Hungarian Army during the First World War. From 1919 to 1924 he studied art in Vienna and Munich. He immigrated to England in 1938 to escape the threat of Nazi Germany, but his parents remained in Gyor. Mayer-Marton only learned of the death of his parents in 1945 and painted Women with Boulders after receiving the news that they had been deported from the ghetto in Gyor and killed. His watercolour shows a bleak landscape with two lonely female figures. The boulders are reminiscent of stones placed on Jewish graves to protect the body waiting for resurrection. Bill Spira (1913-2000) was an Austrian cartoonist who fled to Paris shortly before the outbreak of the Second World War. After a brief period of internment in France, he began working as a forger with Varian Fry’s Emergency Rescue Committee, which helped artists and intellectuals escape Nazi persecution. Spira was deported in 1942 and imprisoned in several forced labour camps, including Blechhammer. In January 1945, Blechhammer’s prisoners were forced on a death march to Gross-Rosen, Buchenwald and Terezín (Theresienstadt), where Spira remained until the camp’s liberation by Soviet troops in May. Prisoners Carrying Cement is one in a series of cartoons Spira drew whilst a prisoner at Blechhammer. He and other artists traded their artworks with POWs, civilian workers and the SS in exchange for food, clothes and other goods. The cartoons in IWM’s collection were gifted by the family of a British soldier who had also been imprisoned in Blechhammer, where he had acquired the drawings in exchange for some cigarettes. Jan Hartman (1926-2009) moved with his parents and elder brother Jiri to the Czechoslovakian countryside in September 1938 to avoid the expected German bombing of Prague. Despite his family's attempts to leave Czechoslovakia, Jan and his brother were deported to Terezín (Theresienstadt) camp in 1942. In the years that followed, the brothers were held at Auschwitz-Birkenau, Czestochowa and Buchenwald, where they were separated. Jan and Jiri were reunited after their liberation in the spring of 1945. Jan learned years later that his parents had been killed at Auschwitz. Shortly following his return home, Jan began a series of paintings which reflected his experience in the camp system: ‘I think it was in '45, I must have done them as quickly as I possibly could, because it was my way of expressing what I had seen... I couldn't do it today, because I wouldn't remember how it was, but at that time I still did. So it was one way of expressing an evidence the same way as I do it today in words’. I went to Belsen shortly after it was liberated. I saw the horrors of mass death. I was nauseated, as every other sane human would be. But it wasn't the piles of rotting dead that fascinated and horrified me, it was the condition of the still living' (Edgar Ainsworth, 'Victim and Prisoner' Picture Post, September 1945). 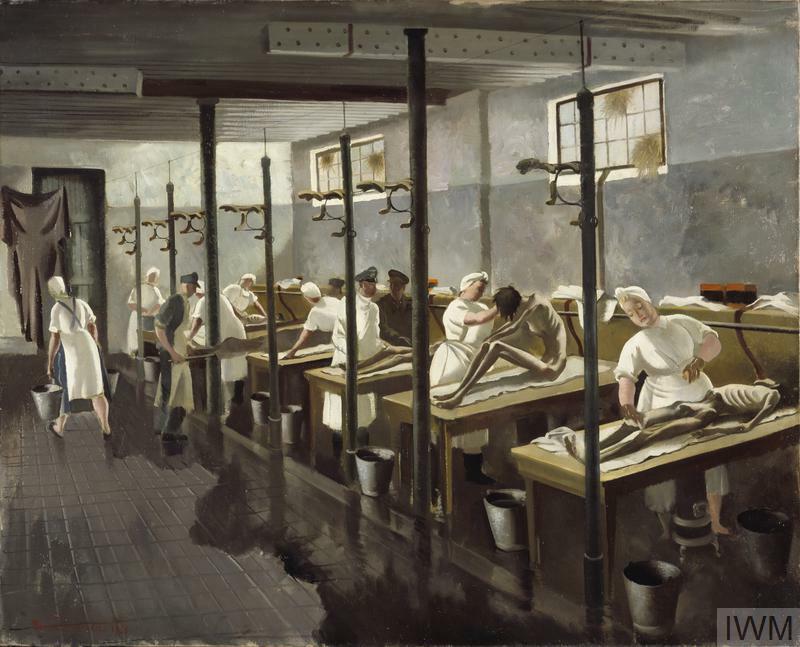 As the Art Editor for Picture Postmagazine, Edgar Ainsworth (1905-1975) visited Bergen-Belsen three times in the months after its liberation. He recorded in his drawings the changes he saw among the people he met there. Ainsworth and the other war artists, including Leslie Cole and Doris Zinkeisen, recorded the sights they witnessed primarily as an official record. They attempted to provide a sense of the scale of horror encountered on Bergen-Belsen's liberation. 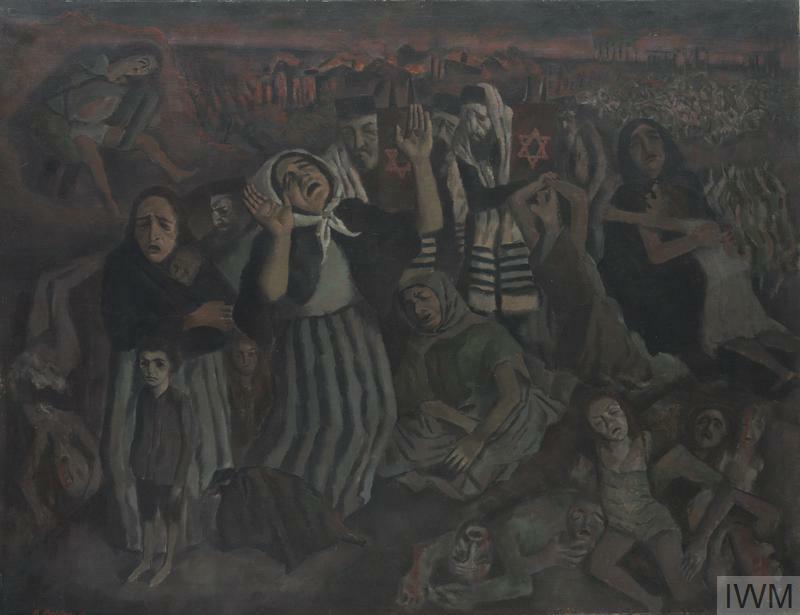 In Belsen 1945, a survivor appears almost indistinguishable amongst the pile of corpses, as the blue wash used echoes the greyness of the victims' skin. In September 1945, Ainsworth published a number of his drawings in Picture Post along with an article that gave his witness account of life in the liberated camp. This article was written in response to the ongoing Belsen Trials and to combat the sentiments of scepticism and indifference he had observed among some members of the general public. Leslie Cole (1910-1977) trained as an artist at the Royal College of Art in London and became a teacher at Hull College of Art in 1937. He was determined to be a witness to the unfolding events of the Second World War. After originally being turned down as a war artist by the War Artists Advisory Committee (WAAC), Cole eventually became a salaried war artist. He travelled widely, recording the aftermath of the war in Malta, Greece, Germany and the Far East. 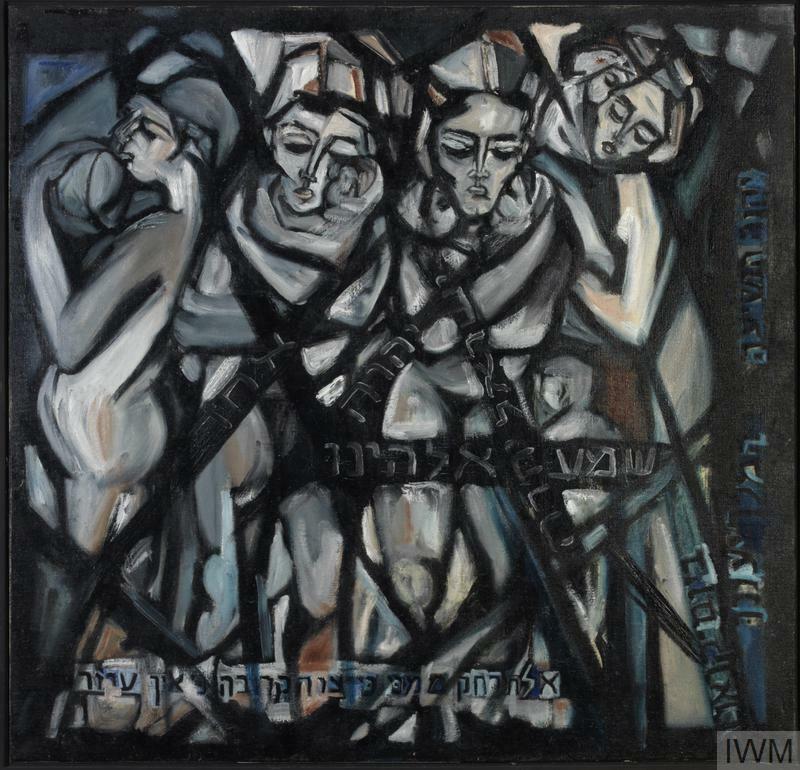 Cole's work consistently addressed the suffering of human beings, and in three oil paintings he bears witness to the conditions in Bergen-Belsen at liberation. He presents the perpetrators as a matter of fact. In One of the Death Pits, Belsen, Cole shows former SS guards collecting and throwing corpses into death pits as uniformed British troops look on. The former guards are depicted almost as anonymously as the dead bodies. Doris Zinkeisen (1898-1991) studied at the Royal Academy Schools in London. She was a well-known society painter and exhibited at the Royal Academy and the Royal Society of Portrait Painters. She also designed costumes and stage sets for the theatre throughout her career. During the Second World War, she joined the St John Ambulance Brigade and in 1944 was commissioned by the Red Cross to paint the work of doctors and nurses in north-west Europe. Zinkeisen arrived at Bergen-Belsen in April 1945, just after its liberation. 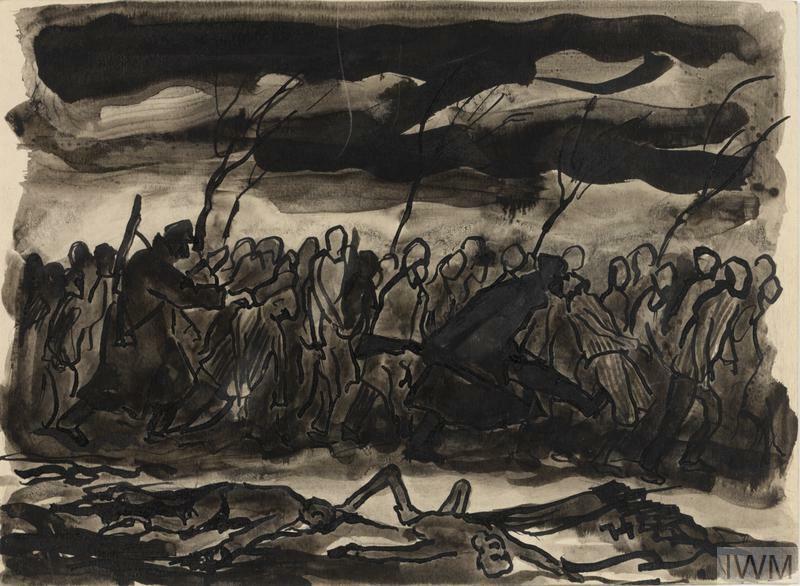 War artists were among the first people to create visual records of the Holocaust. Human Laundry is one of a group of works produced by Zinkeisen during her time as an artist for the Red Cross. The ‘human laundry’ was a stable block converted into a decontamination centre where former prisoners were washed and deloused before being transferred to hospital. It was staffed by German nurses and doctors pressed into service from a nearby military hospital. 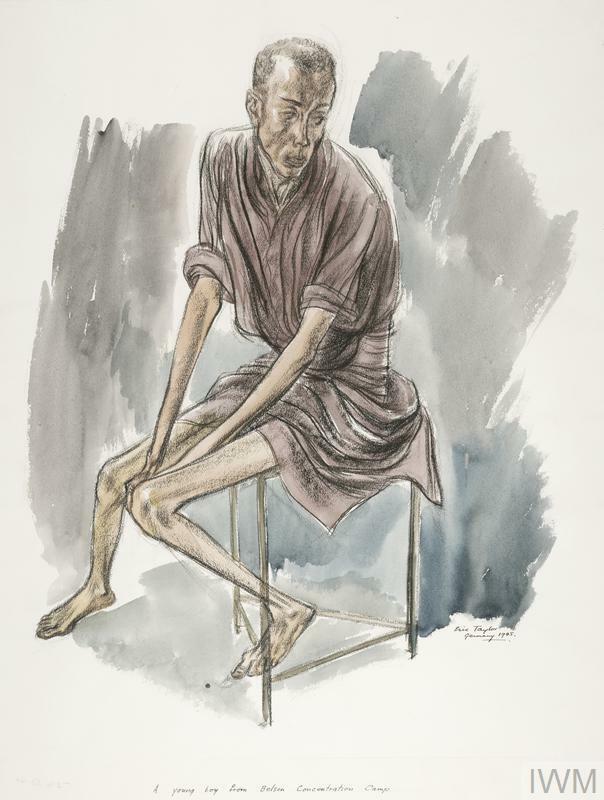 The tension in the composition lies in the contrast and enforced dealings between the emaciated and feeble former prisoners and the rounded bodies of the healthy German medical staff treating them. ‘I drew the dead and scarcely living people when Belsen concentration camp was overrun, and I witnessed at first hand all the other appalling horrors of war. To me, any attempt to explain in words the overall influence of this experience on my work appears to weaken what I endeavour to say in my painting or sculpture. It means so very much.’ Eric Taylor (1909-1999) was already an established painter and printmaker by the outbreak of the Second World War. In 1939, he enlisted to serve with the Royal Artillery and Royal Engineers. He was among the first liberators to arrive at Bergen-Belsen and was one of several artists who saw the camp shortly after it was liberated. Human degradation on such a scale was difficult to portray and Taylor’s most potent images focus on single figures, capturing the state of numbed emotion common to so many survivors. The distant gaze of Eric Taylor's A Young Boy from Belsen seems to lament the loss of so many unseen friends and family. As a viewer, we are compelled to see his loss of youth, a consequence of starvation and disease. Mary Kessell (1914-1978) was one of only three female official war artists to work outside Britain during the Second World War. She arrived at Bergen-Belsen four months after its liberation and her experience of the camp differed markedly from that of artists such as Cole, Zinkeisen and Taylor. By the time she arrived, Belsen had been transformed into a holding place for displaced persons waiting to return home, many of them Belsen survivors: ‘… they are all beginning to live again and children laugh and love you and hold you by the hand. I was amazed at all I saw, it was exciting and most moving.... Relations are traced, and convoys returned to their own countries from the main square, lorries decorated with flags and greenery’ (IWM Documents.18803). Kessell produced ‘Notes from Belsen Camp, 1945’, a series of sensitive and intense drawings of women and children. She also wrote an extensive diary about her experiences in Germany, giving added insight to what she saw and felt at the time. In Notes from Belsen she shows a female refugee being lifted and carried towards transport and possible survival. What at first looks like an image of despair also has an undertone of hope. ‘How many people stop to think that the six million dead were individual human beings with dreams of their own, each with a story to tell, each wanting to live? This is why the people in my paintings are depicted in different colours.’ Edith Birkin was born in Prague in 1927. In 1941, she was sent with her family to the Lodz ghetto in Nazi-occupied Poland. Her parents died within a year, and Birkin was left alone. The ghetto was liquidated in 1944 and the remaining population sent to Auschwitz, where Birkin was selected for slave labour and sent to another camp in eastern Germany. In January 1945, with the Russians now advancing into Germany, the slave labourers were sent on a death march across Germany to Bavaria, where they were loaded onto cattle trucks. After a week in crowded conditions, Birkin arrived in Bergen-Belsen on 15 March 1945. She was liberated a month later. 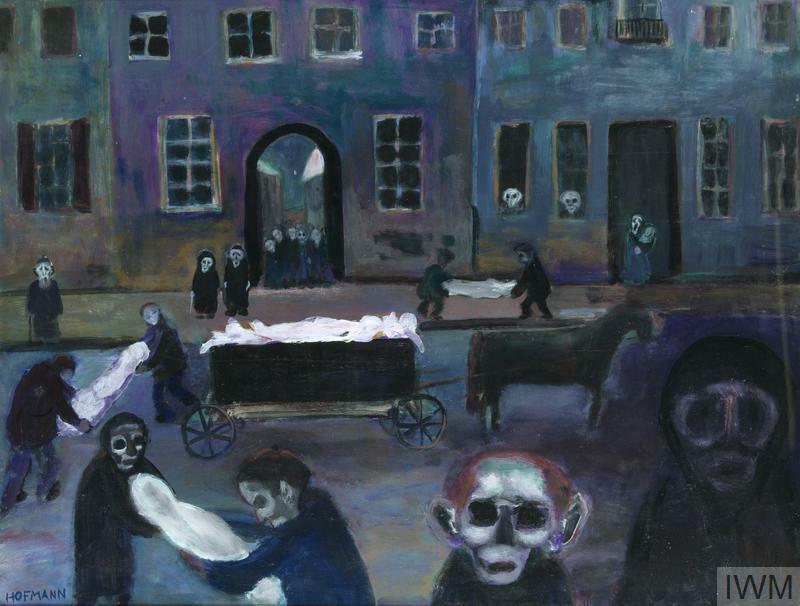 The deep blues and purples in the street scene in The Death Cart – Lodz Ghetto signify encroaching darkness. Loss and fear meld as bodies are carried away. Grieving figures stare at us, silent and motionless. Birkin has said that her works do not express physical cruelty or suffering so much as the sense of loneliness or isolation experienced by so many. Shmuel Dresner was born in Warsaw in 1928. He was 12 years old when he and Warsaw’s other Jewish residents were forced into the ghetto. After briefly escaping, Dresner was caught and held as a slave labourer at several camps, including Buchenwald and Terezín (Theresienstadt). Dresner came to England in 1945 and spent several years in sanatoriums, where he first started to paint. Benjamin (1982) is a portrait and tribute to Dresner’s close friend Benjamin, whom he met when they were both held prisoner during the Second World War. He describes how despite being held in a camp for two years, Benjamin was always cheerful and optimistic. It was this optimism that helped Dresner cope with the death of his father in 1943. One day Benjamin and Dresner were called forward to volunteer for deportation. Benjamin was eager to step up as he hoped that those called earlier would be transported by train. Without knowing why, Dresner hid himself. He later learned that those who had travelled by train, including Benjamin, were shot. Later training as a professional artist, Dresner struggled for many years to find a visual language with which to respond to his experiences. The work’s emphasis is on the memory of Benjamin. 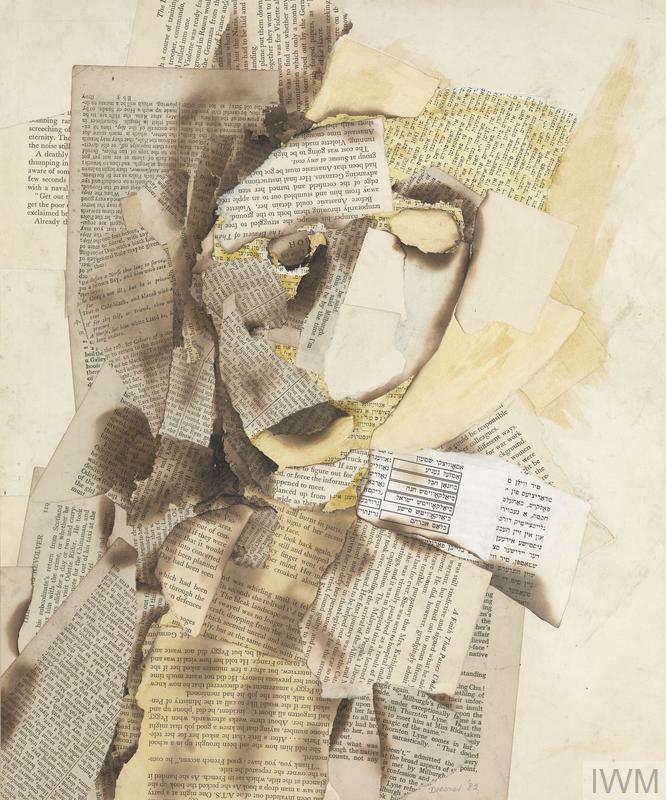 While avoiding graphic description of the trauma and sadness of their situation, Dresner makes references to destruction and violence through the torn and burnt papers from which he constructs the image. Roman Halter (1927-2012) was 12 years old when the Nazis arrived in his home town of Chodecz, Poland. He was forced with some of his family to move into the Lodz ghetto, where he survived by working as a metalworker. By 1942, his entire family was dead. In 1944, he was transported to Auschwitz and Stutthof before being sent to Dresden as a slave labourer. Halter escaped from a death march in mid-March 1945 and hid with a German couple until May. At the end of the war, he returned to Chodecz to find he was one of only four survivors of the town's 800 Jews. Halter eventually travelled to Britain, but he did not create works based on his experiences until much later in life. In Mother with Babies (1974), Halter reflects on the prevalence of death in the camps. It recalls how, on the ramp at Auschwitz-Birkenau, women carrying babies were automatically selected for the gas chambers. The taut lines of his compositions are reminiscent of intricate metal tracery, of the ubiquitous barbed wire of the camps, the sharply honed lines of woodcut prints and even the lead of stained glass windows. One of the most memorable elements of the Holocaust Exhibition is the video testimony by survivors which accompanies visitors along the route. But what happened to the survivors after the Second World War? How did they rebuild their lives in the years that followed their release from Nazi persecution?